Create a lasting impression and convert leads into customers via Circle Dot Marketing’s email marketing finesse. Whether you’re in need of a design upgrade or are looking for turn-key email solutions for your coveted email subscribers, we’ll create a professional email marketing campaign that gets your company noticed and optimizes results. Need a brand upgrade? Circle Dot Marketing will design a branded email template customized for your business. A Professional Partner with Constant Contact, Circle Dot Marketing has expertise in creating the look and feel that reflects your brand. Make informed decisions. We’ll take the guesswork out of the email marketing process by providing thorough reporting and analysis. Our client email campaign open rates and click throughs typically exceed industry standards. Email is not a stand-alone tool. At Circle Dot Marketing, we weave your email campaign into your overall marketing campaign whether the objective is to effectively launch a new product, gain traction, or cultivate new customers. 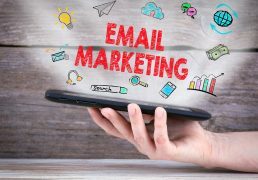 Ready for your email marketing campaign to take flight? Call 702-506-7887, email us at sgee@circledotmarketing.com or fill out the form below.